Magnum Marine is excited about the use of new technology that integrates the control of unmanned aerial vehicles from the helm of your boat. You can now watch the waters around your boat from above. Drones for boats are being utilized by fishermen to help see their surroundings and assist in planning their next catch. Read below for more information on this innovative marine electronic technology. Raymarine Axiom offers UAV integration for boats. Launch and control your drone from the helm. With marine multifunction displays, you can look underwater with sonar, all around the boat with radar, and even peer through the dark with a thermal camera. Now you can also look down from above on your boat, thanks to the unmanned aerial vehicle (UAV) control feature built into the Raymarine Axiom and Axiom Pro MFDs. 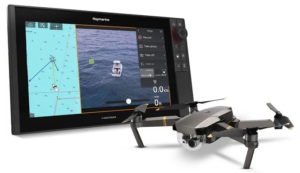 This marine-electronics first allows boaters to connect to a UAV, then control the drone and view images from its camera using the Axiom display. The patent-pending technology is currently compatible with DJI Spark and DJI Mavic series UAV video drones (see “Compatible UAV Models”). Features include single-button launch/track/record functions, GPS link for various follow modes, and real-time video streaming to the MFD. It works like this: First you need to update your Axiom or Axiom Pro with the latest Raymarine Lighthouse software — version 3.5 — a free download directly to the MFD. Then pair a drone such as the DJI Mavic Pro (shown left, $1,299, store.dji.com) with the MFD. Press Take Off to launch the UAV and track it with a live-chart display on one side of the ­Axiom split-screen display, which will show the drone’s ­location, along with the direction in which the camera is pointed, the direction the drone is headed, and the course back to the boat. The other side of the split screen shows a live feed from the UAV’s video camera with data overlays that include the drone’s distance from the boat, as well as its speed and altitude. A Fish-On button is ­designed to automatically capture fishing action. As soon as you hook up (for example, while trolling for tuna or drifting for tarpon), you press the Hook-Up button. The drone instantly launches, acquires and tracks the boat, and starts recording aerial footage of the action. You can also view the action live on the Axiom ­display to see, for instance, if any mahi are following the one you just hooked. The new UAV control function of Raymarine’s Axiom and Axiom Pro MFDs is compatible with these video drones. Click here for original article and more information on this product. PreviousPrevious post:Lenny Kravitz’s New Campaign for The BahamasNextNext post:Spring Cleaning? Don’t Miss the Engine Room!